The Brazil record-drought from 2014 continues and looks to be intensifying in 2015. At peak rain season hopes about January rains filling the water reservoirs evaporated. Drought is affecting most areas of the huge country. Households, farming and industries all suffer deficiency. São Paulo water reservoirs are near collapse and the 20 million city is facing the worst water shortage in recorded history. 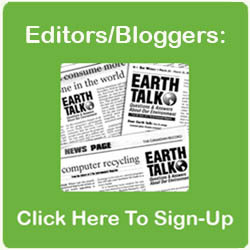 Scientists say global climate change and in particular local deforestation are major causes. Maria Edna Pimentel from Pimentas – a poor suburb of São Paulo – tells me they have not had water for three days. “People gather rainwater,” she says. Water scarcity affects 24 million people in 67 municipalities of São Paulo. Reservoirs for the mega city have vanished and the authorities simply lower the pressure turn off tap water for several days to save. Water trucks have been distributing water around the metropolitan area. There have been riots in areas where up to 15 days without water have been reported. Penalties for increased water use are in effect from February. 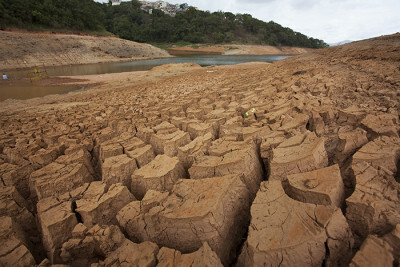 A survey showed the number of disputes over water resources have constantly increased during the extended water crisis. Sebastião de Lima Pedrinho, also from Pimentas, starts to cry. First from anger telling me how richer areas get water while poorer like his are shut off. Later of sorrow when recalling his beautiful childhood rivers, today dried out. “Now there’s nothing. Nothing. They are deforesting all!” he says. 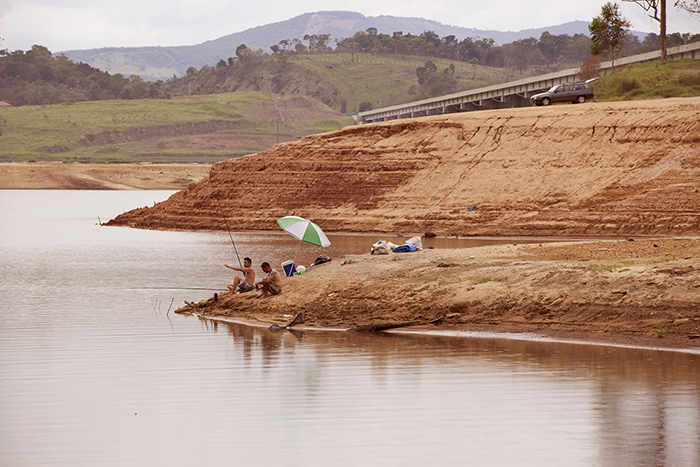 21st of January, Paraibuna – the largest of four reservoirs supplying the Rio de Janeiro state – went completely dry. That has never happened before. Other reservoirs, such as the Santa Branca, Jaguari and Funil have seen water levels below four percent of its original volume. Most of them are in the São Paulo state. There have even been ownership disputes between states over water reservoirs. Several cities had, according to The Capixaba Institute, all time heat record at the end of January. A survey by the Industry Federation Firjan showed 30 percent of the industries in Rio de Janeiro suffer water shortage. Those 30 percent represents around 15 percent of Rio’s industrial jobs. The Ministry of Agriculture estimates billions of dollars in agricultural loss due to the drought already and the consulting firm GO Associados have estimated the agricultural sector could lose 7 billion dollar this year due to water shortage. Irrigation does not cover up rain loss as water sources for irrigation is disappearing. 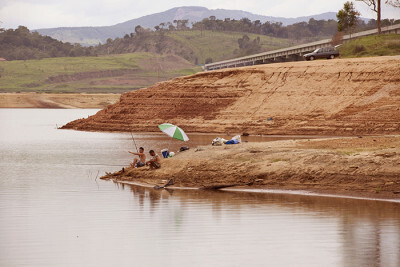 Severino Ribeiro is Sunday fishing in the Cantareira dam system, one of the most important water reservoirs of São Paulo. Almost 10 million people depend on its water although other reservoirs have been rerouted to decrease that figure some. “When I was here in January 2014 the dam was full.” Severino points towards the bank some 10 meters above current level. By early February the system only contained five percent of its normal volume — by far lowest since the system was built in 1974. Dr. Antonio Donato Nobre, biochemistry researcher at the National Amazonian Research Institute, has recently released a report called ‘The Future Climate of Amazonia‘. Dr. Nobre tells me he and his colleges are consentient. “These phenomena would not be happening without climate change forcing,” he says. The Brazilian Panel on Climate Change (PBMC) has made projections indicating 10 percent reduction in local rainfall in the coming five years. Meanwhile Scientists Dr. Anastassia Makarieva and Prof. Victor Gorshkov say that according to their “Biotic Pump Theory” rain decrease models might underestimate the reduction. The Biotic Pump Theory demonstrates how transpiration fluxes of natural forests – from their abundance of tree leaf area – exceed evaporation fluxes over sea surface. This creates low pressure above the forest region, which draws moist air inland from sea. The moist air ascends, condensates its moist as rain and return dry to sea at higher altitude in a positive feedback loop. In other words the forest is pumping wet sea air in over land, distributing rain not only to itself but to surrounding regions as well. Dr. Nobre says a rainforest tree can produce 1000 liters of water from transpiration per day. Contemplating there are hundreds of billions of trees in the Amazon basin, it’s not hard to understand its possible impact on rain and climate. According to an article in Nature by Scott Jasechko et al. up to 90% of terrestrial water contribution to the atmosphere comes from trees and plant transpiration. Moist air paths, so called areal rivers, run from forest regions and may days later produce more than twice as much rain as air that has passed over meager vegetation like farmland. These are claims of Prof. Dominick Spracklen et al. based on a recent pantropical study. They found that the Amazon is in fact the source of most of South America’s rainfall. Makarieva et al. draw similar conclusions in their South American climate study from 2014. Dr. Makarieva and Prof. Gorshkov tell me the São Paulo drought is certainly aggravated not only by the Amazon deforestation, which means less lateral inflow of moist air, but also by local extermination of the Atlantic rainforests. Already in 1991 a simulation indicated that Amazon deforestation would lead to dramatic reduction in rain and increase of dry season. So why do we not see greater efforts to backpedal this development? A particularly demanding question considering the resources continuously spent on wars and international bank bailouts. Strong lobby groups in Brazil oppose forest preservation. Senator Kátia Abreu, known as leading figure of the agricultural lobby was recently appointed agricultural minister. She has been an influential force in weakening the Brazil’s forest code. In parliament she supports more roads through the Amazon, demarcation of indigenous reserves, more efficient monocultures and genetically modified “terminator seeds”. This has given her the nicknames “Miss Deforestation” and “chainsaw queen”. According to the Biotic Pump theory a functioning sea-land biotic pump demands evaporation over land being greater than the sea surface evaporation. 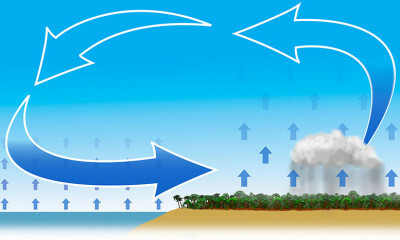 Once sea surface evaporation surpasses land evaporation – for example by turning forest to agricultural land or plantation forest – the “pump” is reversed. Hence moving moisture from land to sea instead of the opposite, possibly resulting in desertification. Prediction models have indicated the whole Amazon basin could turn to savanna after a critical tipping point of deforestation. However, more recent models, including the biotic pump input show they may be wrong. The tipping point consequence might not be savanna but desert and this terrifying scenario could happen as soon as 40 years from now. That is if deforestation and forest degradation are not stopped. 20% of the Amazon rainforest have been erased in just 40 years but the largest rainforest on earth may not only affect Brazilians. According to Dr. Makarieva and Prof. Gorshkov big forests even play a key role in global climate systems. They tell me the Biotic Pump of the Amazon and Congo removes substantial amounts of evaporated moisture from the Atlantic Ocean. If these pumps stop functioning it could lead to significant change in the intensity of trade winds. According to NASA, NOAA and the World Meteorological Organization, 2014 was the warmest year on record. Ever. During 2014 we’ve seen record-breaking droughts in Africa, China, India, USA, Australia and South America, whereas other places have experienced extreme floods. While the Amazon rainforest disappears, Canada, Russia, USA, Indonesia, China and the Democratic Republic of Congo furiously chops down their forests. Deforestation of the Russian boreal forest, the largest forest on earth, is besides Amazonas another ticking climate bomb. Sweden and Finland have degraded almost 100 percent of their natural forest to intensively clear cut-harvested CO2 emitting plantation forest and Russia seeks to follow the example. Forest of an area roughly equal to India have disappeared worldwide only the last 15 years. If we listen to Dr. Makarieva and Prof. Gorshkov, global deforestation might even be a greater cause of climate change than CO2 emissions as water vapor is a more potent greenhouse gas and the Biotic Pump continuously removes it from the sea surface. Atmospheric vapor has the capacity of creating a runaway greenhouse effect as the moist content rises exponentially with increased sea surface temperature. According to them the worst-case scenario runaway greenhouse effect could ultimately lead to a Venus-like climate of several hundred degrees. The biota – especially forests – seems to be a necessary stabilizing factor of our climate. They have developed for hundreds of millions of years, thus might in fact have created their own climate. The very climate Homo sapiens were born into some two hundred thousand years ago.